Mind if we make love to you? Brian Wilson, Eric Clapton, Paul McCartney, and members of S Club 7. Like most groups, their beginnings were the result of a collaboration between a pair of enthusiastic music fans — keyboardist Sahanaja and guitarist Walusko. Following a collection of self-recorded/self-released cassettes of their brilliant homespun confections (and the crucial addition of drummer/vocalist D’Amico), the group inked a deal with Japan’s Toy’s Factory Records who released their debut album — an assemblage of tracks from the aforementioned cassettes — in 1995 and contributed to an endless stack of compilation albums as well as penning the title track to “Austin Powers: International Man Of Mystery”. Interest from Beach Boys mastermind Brian Wilson and other elders of the pop music world elevated the band to a near-mythical status, and although their sophomore effort — 1996′s “Wonderful World Of Wondermints” — was merely a collection of cover songs (albeit the most unique collection of cover songs since Bowie’s Pin-Ups), they bounced back in 1998 with their true “debut” album, “Bali”. 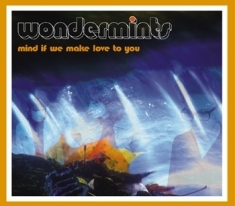 Since the album’s release, Wondermints have become the toast of the international rock scene, performing worldwide as members of Wilson’s band, a gig that exposed them on several late night talk shows, found them being invited to weddings by ex-Beatles, brought them acclaim from shrieking Japanese groupie girls, and eventually thrust them onstage performing in front of the Queen Of England. It’s a long way to the top, but it’s even a longer way from the Astro Family Restaurant in Silver Lake to Buckingham Palace. On their highly anticipated fourth album and most collaborative effort to date — “Mind If We Make Love To You” — Wondermints guide us through a stunning song cycle in sensual surround sound, a jet setting romp through inner space by the proven masters of the aural massage. Music this divine isn’t inspired by tense boardroom meetings or uptight A&R clowns, but by such otherworldly realms as that playground of plastic ‘n’ fiberglass known as Tomorrowland and endless summer nights spent at the purple-hued, U.F.O.-like cocktail lounge The Encounter that towers high above LAX. Wondermints have always been light years ahead of their peers, and their music has always been inspired by an affection for a superb palate of sonic architects, a fusion of such unlikely bedfellows as Brazilian psychedelic mavericks Os Mutantes, soundtrack svengali John Barry, Elvis Costello, and sophisticated ’60s pop stylists like the Zombies and the Left Banke effortlessly blended with a liberal dosage of West Coast studio wizardry and deceptively tolerant elements of prog rock. Mind If We Make Love To You? I thought you’d never ask.